Air pollution takes more years off your life than smoking. Air pollution, caused largely by burning fossil fuels, is cutting global life expectancy by an average of 1.8 years per person, making it the world’s top killer, researchers said on Monday. Particulate pollution is deadlier than smoking, alcohol and drug use. The tiny particles ingested from polluted air shorten life more than first-hand cigarette smoke, which can reduce it by 1.6 years, and are more dangerous than other public health threats such as war and HIV/AIDS, they said. The University of Chicago’s Air Quality Life Index (AQLI) shows people in parts of India, the world’s second-largest country by population, could live 11 years less due to high levels of air pollution. 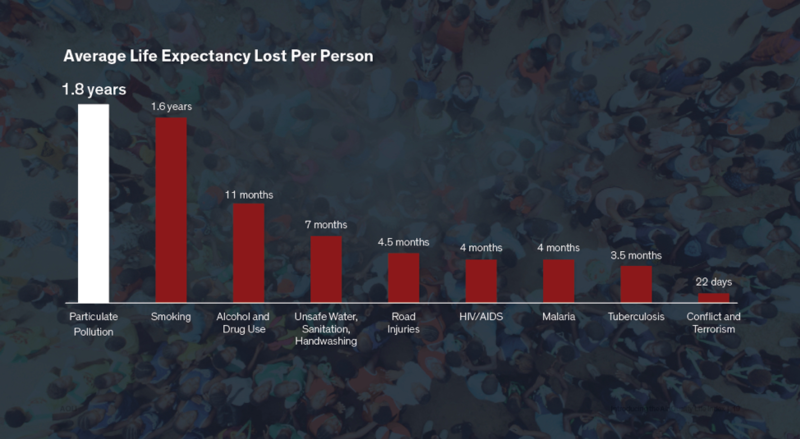 Life expectancy averages slightly below 69 in the South Asian nation of 1.3 billion, according to the World Bank. The researchers launched a website that tells users how many years of life air pollution could cost them according to which region of a country they live in. The index seeks to transform hard-to-comprehend data into “perhaps the most important metric that exists - life”, Michael Greenstone, director of the Energy Policy Institute at the University of Chicago (EPIC), said in a statement. Particulate pollution is normally measured in micrograms per cubic meter. “The fact that this AQLI tool quantifies the number of years I and you have lost to air pollution makes me worried,” Kalikesh Singh Deo, an Indian member of parliament, said in a statement shared by EPIC. China and Indonesia are also among the countries where microscopic particles floating in the air hit residents the hardest, cutting their life expectancy by as much as seven years and five and a half years respectively, the website shows. Other studies have previously looked into the number of people who may die prematurely because of air pollution. But the EPIC scientists hope the website - the first of its kind, according to the institute - will make the consequences of policies that promote dirty energy more tangible, and encourage reforms that promote better air quality.